What is your dream destination? The best way to get a daily reminder of your favorite big city, is to hang it up on your wall! Here you will find trendy world maps posters and prints featuring world maps, city maps and beautiful city photographs. Maps posters and prints featuring world maps, maps and landmarks are sure winners on your wall! Decorate your home with your favorite city poster or dream destination. 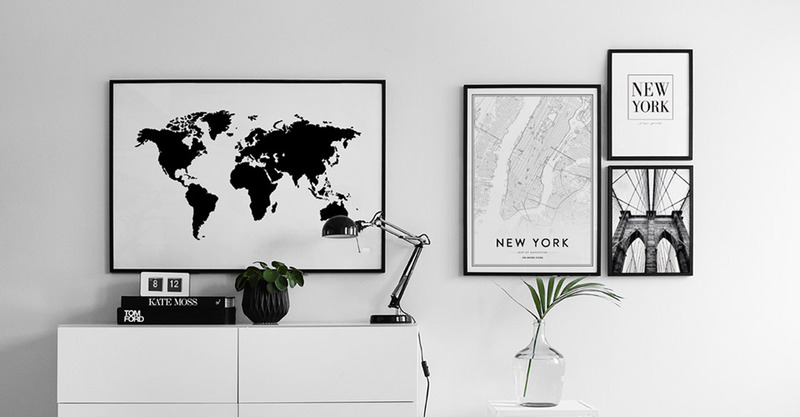 This is where you’ll find prints with maps of New York, Paris, Stockholm, London, Barcelona and several other big cities posters. We even have attractive variations of world map posters in gold, silver, and black & white. Pretty city posters are perfect in combination with e.g. a text print. In our category Maps & Cities you will also find striking black-and-white photos of famous buildings, such as the Eiffel Tower, Big Ben, and the Brooklyn Bridge.